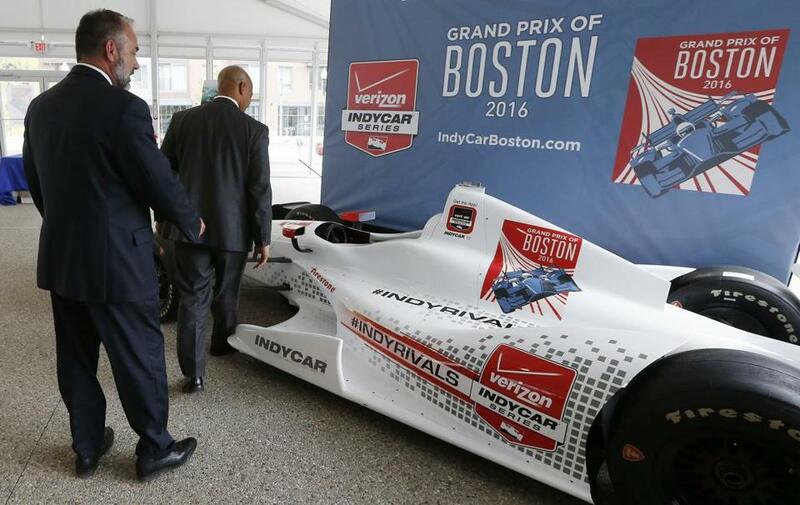 Officials examined an IndyCar mock-up after a news conference in 2015 announcing the inaugural Grand Prix of Boston. Promoters of an IndyCar race scheduled for Labor Day weekend in the Seaport said they began selling tickets Friday, saying negotiations are nearing completion on the final agreements to hold the three-day event. The first tickets were sold to fans who signed up for advanced sales through the Grand Prix of Boston website, as well as race sponsors and their employees, according to Grand Prix of Boston. Tickets for the general public will go on sale Tuesday. “We have made a lot of progress on plans and approvals for the race, so this is the right time to take this step,” said John Casey, president of the Grand Prix of Boston. Race organizers had hoped to open ticket sales in November, but held off after Mayor Martin J. Walsh’s office asked organizers to complete agreements with state agencies first. In December, race promoters signed a letter of intent with representatives of several government agencies whose cooperation was needed for the race to go forward. The agencies — the Massachusetts Port Authority, the state Convention Center Authority, the state Department of Transportation, and the MBTA — have continued negotiating with promoters on final agreements to hold the race, which Casey said are largely complete. Race opponents, meanwhile, have been urging state officials to demand greater environmental review of the race plans. “It’s a bad move to start selling tickets when the promoter doesn’t have any legal right to use public roads for the race, hasn’t even begun the environmental review process, and hasn’t addressed the huge impacts that the race will have on the Fort Point, Seaport, and South Boston neighborhoods,” David E. Lurie, counsel for the opposition group Coalition Against IndyCar Boston, said in a statement. The inaugural Grand Prix of Boston, scheduled for Sept. 2 to 4, would run on a 2.2-mile temporary street course around the Boston Convention & Exhibition Center. Promoters last May signed an agreement with Walsh to hold the race in 2016, and annually for up to four more years. Three-day reserved grandstand tickets to the weekend event cost $150 to $205, according to the Grand Prix of Boston. General admission tickets will be $99 for a three-day pass. In addition to racing, organizers are planning concerts and other events.